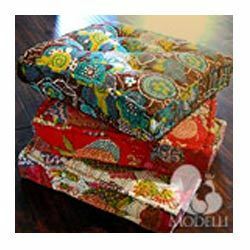 Our organization is indulged in offering a qualitative range of Kantha Floor Cushions to our clients. These cushions are acknowledged among clients, owing for their comfort ability and excellent finish. Also, our products are available in varied colors and fittings to meet divergent demands of the clients. Furthermore, these are manufactured using cotton fabrics with kantha work in variety of prints work, in accordance with set quality standards. Trident Marketing Solutions is a company focused on designing,manufacturing & Exporting hand-crafted Indian products which includes Floor Cushions, Sari Throws, Floor Pillow And Throw Cushions, Bedspreads and Throws, Throw Pillow, Crewel Work, Parasols, etc. The company was incorporated in 2002 and is based in Gurgoan (Haryana,India) The offered products are fabricated using the optimum quality fabric and sophisticated technology. Furthermore, we make use of the most advanced techniques in order to dish out products as per international quality standards. These products are highly appreciated among clients due to their unique designs, eye-catching looks, excellent stitching, and a perfect finish. Our products are available in variegated colors, styles, designs, sizes and patterns as per varied requirements of our clients. Further, these products are tested by our quality controllers on various quality parameters, in order to ensure that these are absolutely flawless.